Metal Gear Survive was released on February 20, 2018. Over a month later with no review, some might be wondering what’s taken so long. After sinking over seventeen hours into it, I’ve finally come to terms with this: I can’t finish this game. Now, I know that might sound melodramatic. “Oh, poor Mike, he has to play a video game. What a catastrophe, right?” But this isn’t just me trying to wuss out on a game; Metal Gear Survive hurts to play, and I mean that sincerely. This isn’t a joke and I’m not exaggerating; this game has broken me. Let’s take a walk down memory lane, to a simpler time in my life. When I was fourteen, my sister had knee surgery and I was taking care of her over the summer. Often, when she was asleep on the couch, I would play video games. Usually it was Splinter Cell or something like that, but one day I pulled out a copy of Metal Gear Solid 2: Sons of Liberty. Just looking at the box art hooked me. I knew who Solid Snake was from watching Vash12349 on YouTube, as well as from Super Smash Bros. Brawl. I booted the game up and once I started playing I couldn’t stop. My aunt had to pull me away from the controller to get me to eat and before I knew it, I had beaten the game. I didn’t know what to do, but I knew I needed more, and that’s when my aunt brought home Metal Gear Solid 3: Snake Eater. I was beside myself because I had more to play, more to experience from this insane, whacked out espionage world. I popped in Snake Eater for the first time and my jaw hung agape. The cinematic style, the James Bondesque musical title screen, and all the new mechanics blew my mind. The cure menu, healing yourself when you were injured,the survival menu, eating food, making sure said food didn’t spoil, and hunting for new meals, the new camouflage system; the new tools at my disposal were mind-blowing. The stealth gameplay had been honed to a science, and the boss battles were inventive and multi-faceted. I still remember finding out that there were multiple ways to beat The End. Kojima had fashioned a masterpiece in Snake Eater, and to this day it’s is my favorite of the franchise. Fast forward about a year, after I finally got a PS3 and was able to experience such games as the Uncharted franchise and the newest Call of Duty, I finally picked up Metal Gear Solid 4: Guns of the Patriots. I didn’t think games could get closer to film, but this one changed my tune. Some say the cinematics are excessive, but I just found myself so engrossed in the story that I didn’t care. Guns of the Patriots was epic, funny, action-packed, and a surprisingly touching send off to Solid Snake as the end of his tour of duty. That was in the early 2010s for me, and only half a decade later we’d finally see Metal Gear return in Metal Gear Solid V: The Phantom Pain. This would also be where the infighting at Konami began. Konami and Metal Gear creator Hideo Kojima started fighting more publicly, as Konami tried to strike all evidence of his involvement from the marketing for Phantom Pain. When the game was released, I was overwhelmed. I still haven’t finished MGSV because of its length and having to replay the whole game after my PS4 crapped out, but what I did play felt so finely tuned, even if the story seemed threadbare. But the game made the leap to the open world structure fantastically. There was a lot to see and a lot to do, from the various side missions to hunting for animals to send back to Mother Base, as well as many outposts to practice your stealth skills on. There were two areas, Afghanistan and Africa, that were polar opposites. The dry, arid deserts of the former were gorgeous with emergent sandstorms, which you could use to sneak by enemies easier; Africa, however, was populated by trees that you could hide behind. The AI was pretty on point too, especially if they spotted you. The only Metal Gear game I still have yet to play is the first, which will be remedied soon. But I just wanted to put all of this out there to explain that I’m not new to this franchise and how incredibly important the Metal Gear games are to me. Then it happened: Konami announced Metal Gear Survive in August of 2016 to a resounding thud. We as a community knew what Konami was doing: they were milking and bastardizing the masterpiece creation of Kojima and turning it into a run of the mill survival/zombie game. 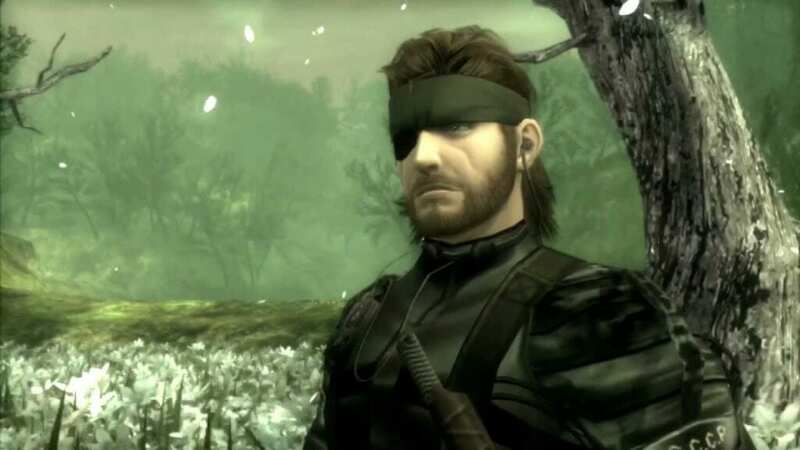 The first trailer didn’t give us much to go on other than the concept and a little bit of setup; it wasn’t until we saw some gameplay that what Konami was doing to Metal Gear really sunk in. I had resolved to not pick the game up at all, as I didn’t want to support this crap, but I took on the review anyways. As the resident Metal Gear guy on the team, I was hoping that it would be tolerable at best, but at worst I could perhaps find some kind of catharsis through ripping it to shreds. So I downloaded the game the night of release with an open mind, hoping to at least enjoy the 40 dollars I had spent. I knew as soon as I wasn’t allowed to even play on launch night — due to the game requiring a Day One patch that hadn’t been released for download — that I was going to have a bad time. When I was actually able to begin the game, Metal Gear Survive started out fine enough, opening with a solidly directed cutscene. But this is where I began to notice something was off when compared to other Metal Gear games, because the voice-work was incredibly flat. After finally getting to a point where I was able to play, it really sunk in how much of a reskinned MGSV the game is. The controls are virtually the same, with some minor changes to accommodate the different new moves, and the first area is Afghanistan with broken pieces of Mother Base scattered around. It was at this point that I just had to look at the screen with my jaw on the floor. Metal Gear Survive truly might be the laziest Triple-A games of this current gaming generation. Let’s skip ahead a little to when you set up base camp, along with your forgettable enemy-turned-ally teammate. You stumble upon a previous squad’s — the Charon Corps’ — camp and find Virgil, an AI robot in a canister. This could have been cool, and before the AI figuratively opened his/her mouth, I thought it might be. But the problem is when they start talking, and I mean THEY; Virgil has a split personality, which, again, could have been cool, but they do nothing particularly interesting with it. One is voiced by a man and the other a female. The voice acting is flatter than even before, with Virgil droning on in this deliberately slow and stereotypically robotic voice. I get what they were going for, but they wound up creating two grating personalities that never shut up. They repeat the same lines every time you’re hungry or thirsty. They also say the dumbest things when you die. It’s not fun, in the way of Metal Gears past (“SNAAAAAAAAAKE!”). Its cringe-worthy, and the worst part is how frequently you have to hear it. Speaking of hunger and thirst, the survival elements feel so unbalanced. The rate at which you get hungry or thirsty is WAY too fast. Couple that with how difficult it is to procure food and clean water, and the opening hours of Metal Gear Survive can be incredibly frustrating. I spent a bunch of time dying of hunger and thirst, and when my character finally gave up the ghost and I had to return to base camp, they respawned me with a paltry amount in my hunger and thirst meter. It felt like I was trying to dig myself out of a deep hole, but the hole just got bigger until animals and the clean water near the camp finally showed up. The only other option was to drink dirty water, which, naturally, gets you sick. That’s fine and dandy, but when it’s your only option early on, expect to frequently have to stop walking about to vomit until you finally stumble upon medicine. Let’s talk about the story and structure for a moment. As the trailers show you, after the events of Metal Gear Solid: Ground Zeroes (the prequel chapter to The Phantom Pain) your player-created character is brought into a wormhole (that, conveniently enough, Big Boss never sees) to a world called Dite. Once there, you have to investigate the Charon Corps and their activities, rescuing whoever you can. Simple enough, and that’s the problem; the story is so boring and told in the laziest way possible. There are cutscenes from time to time, but information is primarily conveyed to you through static scenes with lifeless dialogue. The older games had lengthy codec calls, don’t get me wrong, but they also had full on cutscenes that SHOWED you a story, not just told you one; it also helped that the voice acting was so much better. So you get lifeless characters, voice by actors that sound like they’re just cashing a paycheck, bland storytelling, and a drawn-out playtime. The sheer amount of grinding and repetitiveness is disgusting. The story routinely forces you to do the same tasks over and over again: defend this, mine this, find this item, rinse and repeat. It’s an endless stream of busy work and repeated mission types. The only thing that changes is how long you have to defend this or how large the area you have to defend is. It’s exhausting. I’d love to tell you that I like the visuals, but honestly, this just an asset-flip of MGSV, and at times its pretty blatant. They lift entire pieces of the map, and the only mildly interesting part of the game is the Dust, a deadly fog that will kill you if you don’t have an oxygen tank. From a distance, it looks like an imposing white wall. Once you enter it, however, it just makes the game look nasty, and it causes your waypoints to disappear and reappear randomly, rendering those pretty useless. The visual effect for exiting the Dust is really obnoxious too, as it lasts too long and obscures your vision, which can cause you to walk into an enemy on the other side and take damage. The worst part about the maps is the general lack of vehicles. Especially in the earlier hours, the vehicles are inside the Dust, and they get damaged as you try to drive them out of the Dust, so you spend the majority of your time walking from place to place to conserve your stamina, hunger, and thirst meters. It gets a little easier once you open up wormholes and are able to fast travel, but either way you’re going to be hoofing it a lot. 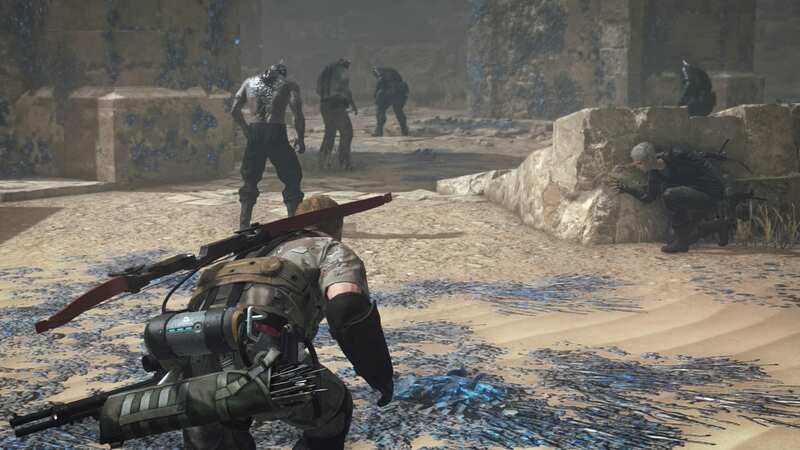 Metal Gear Survive’s main enemies are the Wanderers, zombie-like creatures with crystals jutting from their half-skulls. They have a cool design, but that’s really where the pros end for them. They’re mindless creatures, and that’s fine; many zombie games have similar enemies. The worst thing about the Wanderers is how they attack you. Scenario: You’re sneaking through the environment and stumble upon three Wanderers, they spot you and all you have is a shovel. This is early in the game, so you really don’t have any useful skills yet, and your only option is to kill them. Simple enough, right? You approach them, ready your weapon and one of them smacks you and staggers you, and while you are caught in the stagger animation, the next one hits you, then the third, and you’re dead. I’m not kidding; that happened to me multiple times before I finally armed myself better. Once you get the bow and arrow, engagements get kind of boring for a long while. You can easily pick off stragglers with the bow by scoring some easy headshots. The only weird thing is that the bow is meant to be a stealth weapon, but if you nail a Wanderer with an arrow, it attracts the other enemies. That doesn’t make any sense to me. The ease with which you take on Wanderers after a certain point really makes the game a slog… that is, until they introduce new enemy types. I’m fine with this, and I’m even fine with the enemies they added, stereotypical though they may be. My problem is that they just show up without warning, so you’re moving about the environment and all of a sudden explosive shards are being lobbed at you and you’re being hunted down by a fast and nimble Wanderer. An establishing cutscene would have been nice, but there’s nothing. I started a defend mission and was straight up murdered by both of these new enemy types almost immediately. I know some of you are probably already typing “git gud,” but come on, that’s just ridiculous. To make matters worse, there aren’t always mid-mission checkpoints, so if you run all the way across the map, almost finish a mission, then die, your only option is to run all the way back from camp and restart the mission from the beginning. Let’s also talk about the game always being online. Like…why? Why do I need to be connected to start the game if I’m playing in single player? Why are we doing this in 2018? Also, ten bucks for a second save slot? REALLY? That’s disgusting. Let’s talk about something positive for a moment. I actually enjoyed the multiplayer, when I could play it. Defending against waves of Wanderers with friends is entertaining, especially because they can watch your back and you have more eyes looking out for invading enemies. Each teammate bringing their kits in, and setting up various defensive and offensive gadgets makes the waves of Wanderer killing entertaining. You can also hit grenades out of the air with a baseball bat; what more do you need? There’s some okay music in the game too, but nothing at the level of previous entries. That’s really the extent of my fun with Metal Gear Survive. 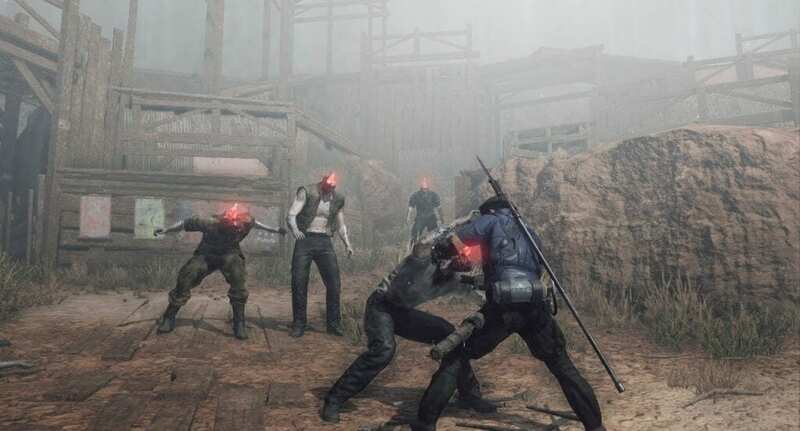 The worst part of playing Metal Gear Survive was knowing you were experiencing Metal Gear’s death rattle. Booting this game up felt like I was watching them put the final nail in the casket of the franchise I’ll remember until the end of my life. A pit formed in my stomach, like seeing an old friend move away. I’ll always respect the Metal Gear games before this, I’ll always replay them, and I’ll always love them. My utmost respect goes out to Hideo Kojima, David Hayter, and every single other person that made the old Metal Gear the series it was. Part of me feels bad for Konami; they ran off one of their most talented individuals, milked his franchise for all it was worth, and made fools of themselves in the process. Mostly, as a longtime fan of Metal Gear, I’m just disappointed to see it disrespected this way. Rest easy Snake; you’ve earned it.